Travel Grant application is now open for African Innovators to attend Seedbeds of Transformation Conference 2018 in Port Elizabeth, South Africa. The Seedbeds of Transformation conference will provide a collaborative, transdisciplinary space for people with diverse perspectives to explore transformations and the SDGs in Africa. The meeting will draw on a wide range of knowledge and regional contexts to identify appropriate pathways for achieving these goals in Africa. Designed around the concept of an innovation marketplace, this three-day conference will bring together innovators from research, government, industry, NGOs, the media and more. 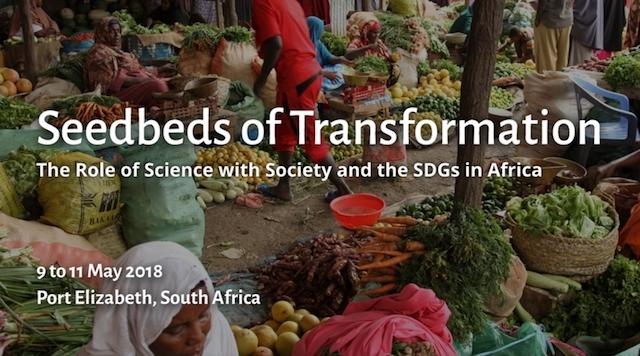 Future Earth will provide a limited number of travel grants for individuals based in Africa to participate in the “Seedbeds of Transformation: the Role of Science with Society and the SDGs in Africa” conference. The grants will enable individuals working on scientific, technological and social innovations in support of sustainability to share their ideas and products at the conference. The conference will be designed around the concept of a “marketplace,” allowing participants to share their ideas in an environment that encourages open dialogue. Grantees are invited to present their work, expand their networks and get engaged with Future Earth and partners during and beyond the event. Future Earth will support a limited number of African innovators through a competitive, merit-based selection process. The innovators grant will either partially or fully cover round-trip economy airfare or ground transportation, conference registration fees, accommodations, meals, incidentals and visa costs. Applicants can apply for either full or partial funding, depending on their local or other support. Based on the applicant’s merit and need, Future Earth will offer either full or partial funding. They are looking for creative individuals who are experimenting with new ways of merging ideas and action, blending art and science, advancing innovative research approaches, visualising data, creating links between research and society, conceptualizing challenges and more – with the goal of advancing sustainability solutions tailored for diverse African contexts. Individuals applying for this grant can come from research organisations, government, the private sector, NGOs, media, and the broader civil society based in Africa. These innovations may take the form of new technologies, strategies, concepts and ideas that address both social and environmental change, as well as innovative research approaches. Successful applicants must be employed by or enrolled in a programme, university, organisation, company or other body whose work is relevant to advancing research and action for sustainability. They encourage applicants to join the Seedbeds of Transformation community forum on the Open Network, which will foster dialogue before and after the conference. Be full participants in the conference “marketplace,” sharing their projects and ideas through presentations and dialogue. Share their ideas with a broader audience by working with Future Earth’s communications team to publish one or more blog posts or other digital products. Work with conference partners to showcase their work on their websites. A current CV in English or French should be submitted along with the application. Describe the partners and stakeholders with whom you work on a regular basis and what problem(s) you are collectively trying to address. Describe your innovation. How are you innovating within your work environment? What or whom are you targeting? At what level is it occurring (local, national, regional)? What is changing or could potentially change as a result of your work? What are ways that your work can grow and be sustained? What are the main products, outputs, processes, concepts, etc., that you have completed or are working to complete related to your innovation? Please provide links to websites, publications, etc., if available. Why do you want to share your innovation at the Seedbeds of Transformations conference? How would you envision sharing it in an open and participatory manner? How specifically will you benefit from attending this conference? Will attending this conference positively impact your work environment? If so, please explain. Do you need travel support, and if so why? Is there any portion of your travel costs that could be covered by your organisation? To apply, please fill out the online form here. For more information, visit Seedbeds of Transformation Conference.